“Welcome Home/A Monument of Honor” is proud and honored to present a unique, dynamic and inspirational speaking event to honor the veterans and their families of the Tan Son Nhut Association at 9am on Saturday morning, June 15, 2013 in Chattanooga, Tennessee. THE MISSION: “Welcome Home/A Monument of Honor” is a national project to foster a unique and powerful American legacy which honors the men and women who served in Vietnam as dedicated, loyal citizens who represented the treasured and cherished values of America’s commitment to preserve our natural human freedoms in the world. Throughout the United States, Vietnam veterans have carried the Vietnam War within themselves for decades. Now as these veterans are experiencing their senior years, it is incumbent upon us, as Americans, to significantly honor the dignity of these men and women; their hearts, their feelings, their pathos and their loyalty to their country and to themselves. THE PREMISE: “Welcome Home/A Monument of Honor” is created by Ross Lewis, a former TV Associate Director with WCBS-TV, N.Y. Following 10 years with CBS, Ross was a 22-year professional, international photographer for U.S., Fortune 500 Corporations and the National Football League. In 2009, Ross was awarded as the “Public Citizen of The Year” in N.J. by the National Association of Social Workers. As a veteran, Ross is a former Army Signal officer and son and brother of two West Point graduates. For more than 20 years Ross was certain that the real human stories of the American Vietnam men and women were told within their personal, non-combat photographs. As a seasoned professional, Ross clearly understood that brilliant, powerful visual images were never an ‘accident’. Instead, they were a window into the brief, silent moments of the souls of men and women. During their enduring war of terror, danger, and mental and physical torment, their gentle photographs reflected their own humanity. Stored away in dusty albums and old boxes in attics and garages throughout America, these precious images are not the volumes of combat pictures which we have seen for many decades. Instead, the intimacy of their pictures and poignant words stand as a Forever-Legacy to the people of the United States of America and to the world. Since July, 2010 Ross has traveled over 20,000 miles in 14 states to personally interview and collect these unique, gentle and passionate images from 55 Vietnam veterans who served from 1954 through evacuation of the U.S. Embassy in Saigon in April, 1975. THE JUNE 15th EVENT: Ross will deliver a compelling and inspiring, visually interactive event which will forever touch the hearts of our Tan Son Nhut Association members and families. In addition, Ross will be joined by Randy Smith, the last Marine to pull final Colors at the Embassy on that final April 1975 day. We urge all members and their families to join us on this day. 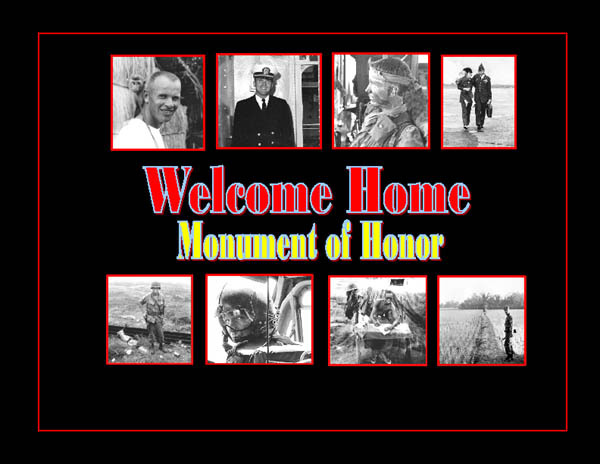 “Welcome Home/A Monument of Honor” is a limited edition book published for Veteran Organizations, Conventions and groups. This first edition book is now available to the public until May 8, 2013. Submit your Name, Email address and # of books you request. Price per book: $30.00 each + $7.00 shipping per book.